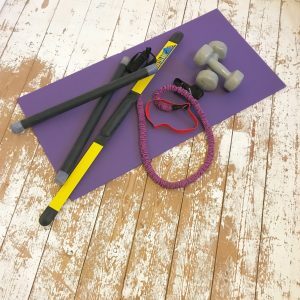 This is a high intensity, low impact fitness class – like HIIT but better! Circuit-style classes are a great way to boost your fitness in a relatively short space of time, but sometimes the dynamic & repetitive nature of the exercises can be too demanding for our bodies, stirring up under-lying injuries or causing problems at a later date. My HI-LI fitness circuit class will focus on exercises which do not involve impact – so no running or jumping. We will use different training techniques & adaptations so that you can increase your heart-rate in a way which does not aggravate any joint, pelvic floor or postural issues that you may have. The exercises will vary every week but will always be safe and effective for anyone who wants to get fitter without adversely over-loading their body. If you have any concerns about whether the class is suitable for you, please email me prior to joining the class so that we can discuss your situation. This 45-minute class will boost your cardio-vascular fitness and tone the whole body, using a variety of equipment and body-weight exercises. All ages and fitness abilities are welcome and you will work at your own pace throughout.